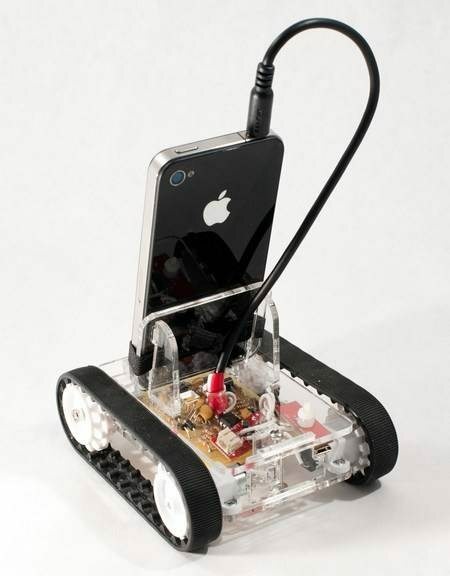 I’m not too sure what the fascination is with turning your smartphone into a robot but in the past we have seen many robot orientated smartphone devices hit the net waves and another such robot project has hit the net waves recently called Romo and is for your iPhone and apparently can turn your iPhone into a spy robot. And naturally we have a video of the Romo iPhone spy robot in action for your viewing pleasure below courtesy of the guys over at Ubergizmo that lasts just 36-seconds so doesn’t really show much about Romotive’s Romo. The Romo connects to your smartphone via its audio jack, and thus one can assume that it’s not just the iPhone that can use the device but most smartphones, although apparently the only app for Romo available currently is an iOS app and an Android app is being produced. Currently the Romo project is a Kickstarter project; however on checking the project is now closed as they have reached their required funding level of $32,000 and supassing it to the tune of $114, 796 so it looks like the Romo project is a go. Like I said, personally I can’t see the attraction of such a device, but obviously many do, so I’ll leave it right there and let you head on down to mash that play button and check out Romo in action…enjoy.